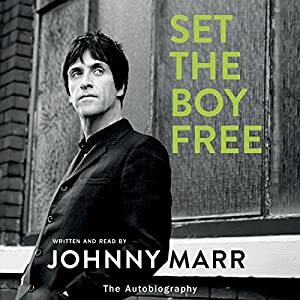 Johnny Marr reads his own autobiography in the unabridged audiobook of Set the Boy Free, which makes it feel more authentic. His reading is a little monotone, but is consistent and clear. Unfortunately, there's no music included, but Marr fans can probably supply it in their own imagination. Marr, born in Manchester 1963, is best known for his work with the Smiths, and he devotes more time to that part of his music career than with any other band, including his more recent solo projects. But the book starts with his life when he was 5 years old, growing up on an estate (known as projects in the USA) in his Irish immigrant family. He sets out his childhood and early practicing with music in considerable detail, and it takes a long time to get to his working with Morrissey. It's amazing that he remembers so much of his youth in crystal clear detail, and he gives a strong impression of what it was like to be growing up as a music-obsessed youth in 1970s Manchester. He was a rebel who avoided school a lot of time and lived a fairly wild life, with quite a lot of drink and drugs. Yet at the same time he was close to his family, even when they disapproved of some of his choices. He met his partner Angie in 1979 and has been with her ever since. These days he both vegan and drug free, and he is an impressive runner, going out most days and even doing marathons. Marr is also clear in his political stance, with frequent condemnation of the conservative policies of Margaret Thatcher and David Cameron. Marr's approach to music was always diligent and committed, and he sets out many of his influences as he was growing up. He also describes some of his music process in writing songs for the Smiths, especially the early singles that made them famous. He gives some information about his relationship with the other band members although he doesn't say much beyond the fact that they used to be close friends. He doesn't provide any particular insights into the character of Morrissey. He gets through his post-Smith music life efficiently, with chapters on all of the people he collaborated with-- the Pretenders, The The, Bernard Sumner in Electronic, 7 Worlds Collide, Modest Mouse, and the Cribs. He makes clear that he enjoyed it all and was in no rush to work on his own. When he did finally create his solo project in 2012, he enjoyed that. He has shown a great willingness to explore different musical styles, and he even moved to Portland, Oregon for several years when he was working with Modest Mouse. He comes across as sincere, thoughtful, and open minded. The book might have been a bit more gripping if he had been more willing to engage in some thoughts about the place of music in modern life and the importance of popular culture, but that might not fit so well with his down-to-earth nature.